It’s Mister Miracle’s trial for treachery by Orion and Big Barda got a vegetable tray to accompany the home trial. Don’t worry, it’s all fine, or is it? Tom King is having a lot of fun playing on the themes of domesticity and honour. 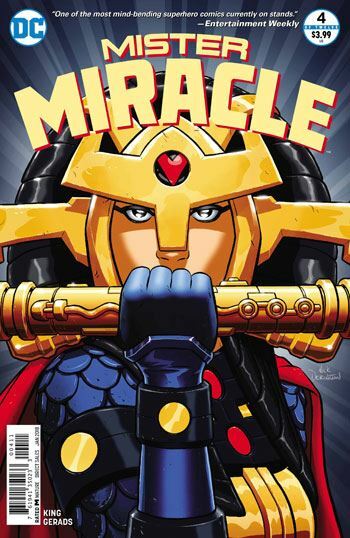 His Big Barda is a great character and this comic is as much hers as it is Mister Miracle. She is so different from any other romantic foil to super heroes that she is just pure fun. Jack Kirby was a genius and King plays with his toys well. The trial is absurd, and the its final ruling only proves how silly the entire interrogation was. This comic may not be for everyone though. 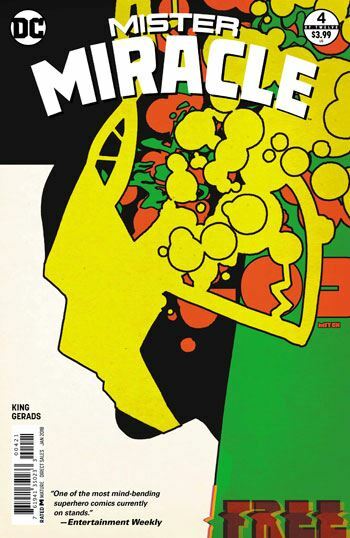 Yes it is cerebral but more than that it is exploration of comic storytelling as good as Keith Giffen or Alan Moore. Mitch Gerads plays so well with space and the arrangement of panels that this comic should be used in classes teaching students about visual storytelling and how to craft a good comic. Gerads fully understands the tools he has and pure pacing through space. Again, few creators have mastered this art as well. He is competing with the likes of Keith Giffen, Larry Hama, and Frank Miller.